I didn’t discover The Chronicles of Narnia as a kid, which is a real shame. It took the movie adaptations to get me interested, and once I started reading I couldn’t put the books down. On my recent second pass through all the books, I caught a wild hare to make a map. 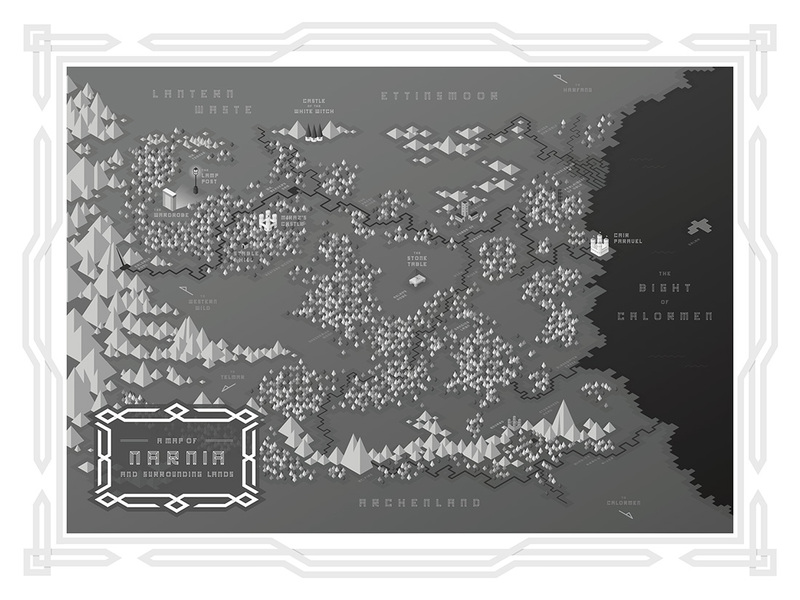 (I’ve always liked maps; I hand-drew a map of Middle Earth as a teenager and have drawn several other maps as accompaniments to tabletop games and original stories.) The map in the book was nicely done, but it was based on the movies, which had added some embellished landmarks. I searched around for all the maps I could find and slowly developed what I understood to be the general landscape as described in the books. Stylistically, I wanted to try something more modern and generally opposite of the hand-drawn aesthetic that most fantasy stories in the vein of Narnia tend to encourage. My Time Motto poster served as the inspiration for a darker, more graphical interpretation of the land of Narnia. Serendipitously, I ran across Joshua Blankenship’s Chizzly font around the same time and that bolstered the geometric style. The map is now printed and hanging on my office wall, reminding me of the several other map-related ideas I have waiting in the wings.